1. Nutakul W. NMR analysis of antipeptic ulcer principle from Curcuma longa L. Bull Dept Med Sci 1994;36(4):211-8. 2. Prucksunand C, Indrasukhsri B, Leethochawalit M, Nilvises N, Prijavudhi A, Wimolwattanapun S. Effect of the long turmeric (Curcuma longa Linn.) on healing of peptic ulcer: a preliminary report of 10 case study. Thai J Pharmacol 1986;8(3): 139-51. 3. อัญชลี อินทนนท์ สมเกียรติ เมธีวีรวงศ์ ประกาย วิบูลย์วิภา พยุงศรี เซียงตระกูล, บรรณาธิการ. รายงานการวิจัยฉบับสมบูรณ์เรื่อง การใช้ขมิ้นรักษาอาการปวดท้อง. โครงการสมุนไพรกับการสาธารณสุขมูลฐาน กระทรวงสาธารณสุข (โดยความช่วยเหลือขององค์การยูนิเซฟ). สำนักงานคณะกรรมการอาหารและยา กระทรวงสาธารณสุข, 2529:7. 4. Prucksunand C, Indrasukhsri B, Leethochawalit M, Hungspreugs K. Phase II clinical trial on effect of the long turmeric (Curcuma longa Linn.) on healing of peptic ulcer. Southeast Asian. J Trop Med Public Health 2001;32(1):208-15. 5. Srimal RC, Dhawan BN. Pharmacology of diferuloyl methane (curcumin), a non-steroidal anti-inflammatory analogs in rats. J Pharm Pharmacol 1973;25(6):447-52. 6. Rao TS, Basu N, Siddiqui HH. Anti-inflammatory activity of curcumin analogs. Indian J Med Res 1982;75:574-8. 7. Permpiphat U, Kieatyingungsulee N, Anulakanapakorn K, Jirajariyavech W, Kittisiripornkul S, Juthaputhi U. Pharmacological study of Curcuma longa. Symposium of the Department of Medicinal Science, Bangkok, Thailand, Dec 3-4, 1990. 8. Chey WY, Laura M, Lee KY, Watanabe S, Shiratori K, Takeuchi T. Effect of 1-phenylpentanol on release of secretin and exocrine pancreatic secretion in dogs and humans. Gastroenterology 1983;84:1578-84. 9. Gujral ML, Chowdhury NK, Saxena PN. Effect of indigenous remedies on the healing of wounds and ulcers. JIMA 1953;22(7):273-6. 10. Rafatullah S, Tariq M, AI-Yahya MA, Mossa JS, Ageel AM. Evaluation of tumeric (Curcuma longa) for gastric and duodenal antiulcer activity in rats. J Ethnopharmacol 1990;29(1):25-34. 11. Sinha M, Mukherjee BP, Mukherjee B, Sikdar S, Dasgupta SP. Study of the mechanism of action of curcumin: an antiulcer agent. Indian J Pharm 1975;7:98-9. 12. Prasad DN, Gupta B, Srivastava RK, Satyavati GV. Studies on ulcerogenic activity of curcumin. Ind J Physiol Pharmacol 1976;20(2):92-3. 13. Gupta B, Kulshrestha VK, Srivastava RK, Prasad DN. Mechanisms of curcumin induced gastric ulcer in rats. Indian J Med Res 1980;71:806-14. 14. Mukerji B, Zaidi SH, Singh GB. Species and gastric secretion in rabbits. J Sci Industr Res 1961;20:25-8. 15. Mahady GB, Pendland SL, Stoia A, Hamill FA. In vitro susceptibility of Helicobacter pyroli to botanicals used traditionally for the treatment of gastrointestinal disorders. Phytomedicine 2000;(suppl II):95. 16. Mahady GB, Pendland SL, Yun G, Lu ZZ. 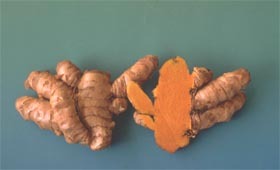 Turmeric (Curcuma longa) and curcumin inhibit the growth of Helicobacter pyroli, a group 1 carcinogen. Anticancer Res 2002;22(6C):4179-81. 17. Foryst-Ludwig A, Neumann M, Schneider-Brachert W, Naumann M. Curcummin blocks NF-KB and the motogenic response in Helicobacter pyroli-infected epithelial calls. Biochemical Biophysical Research Communications 2004;316(4):1065-72.